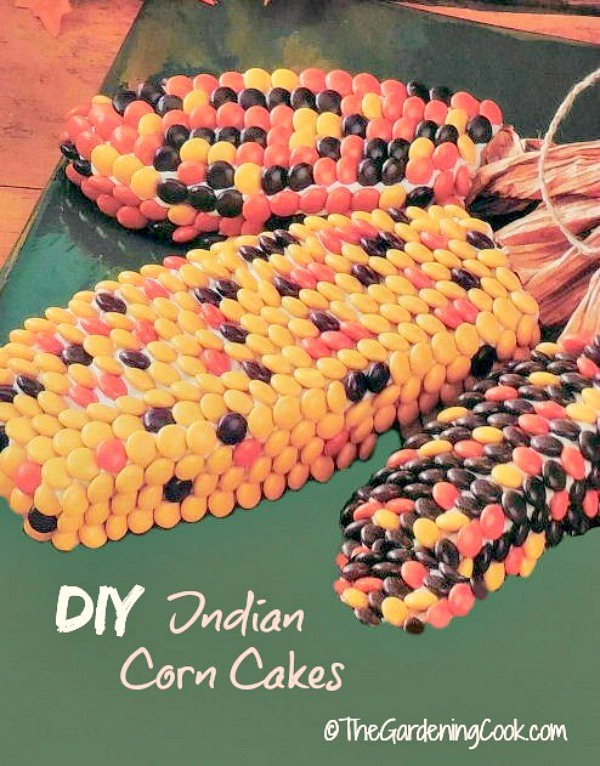 This do it yourself project for Indian Corn cakes will really brighten up your Thanksgiving table. The cakes are authentic looking and are easy to make. The only problem will be keeping the kiddies out of this until after the meal. Thanksgiving tablescapes often make use of a centerpiece that gets showcased in the center of a table. 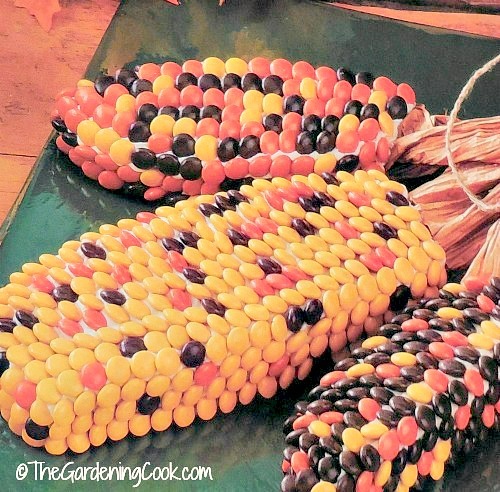 This edible centerpiece would make a perfect addition to any holiday table. Make the cake according to the directions on the package and fold in the peanuts. Cool for 10 minutes and then remove from the pan and cool completely on a wire rack. When the cake is completely cool, freeze it so that it will cut easily. 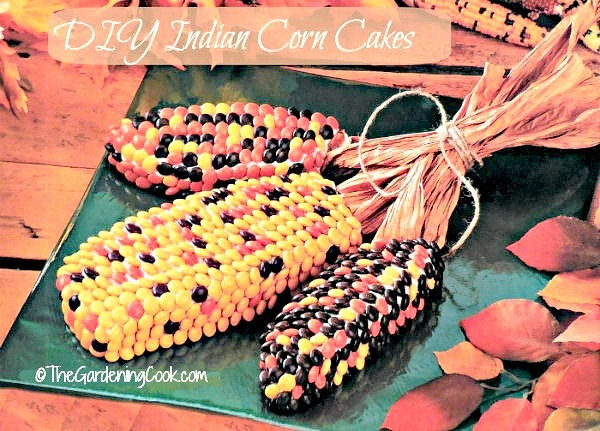 Cut the cake into three ears of corn as shown in the photo below. Place the ears on your serving platter. Frost the top and sides of the cake with 1 1/2 cups of the frosting. Leave the top of the ears un-frosted for now.Decorate the ears with the Reese’s pieces, overlapping them slightly. Cut the paper twist into 8-12″ lengths and untwist them. Spread some of the remaining frosting on the top of the ears. 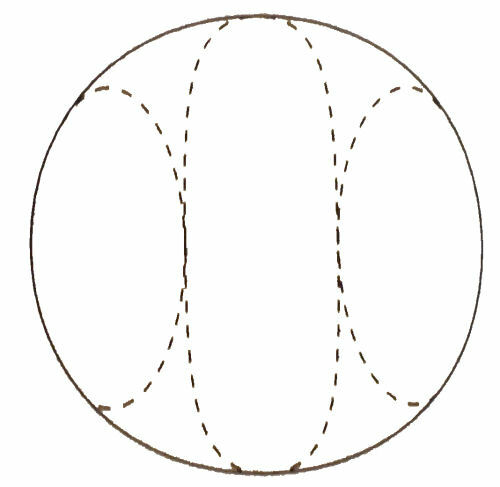 Fold under 1″ of the paper twist and press against the frosting on the top of the ears. Secure with toothpicks. Gently gather the paper twist together in the middle and die with the jute. Wait for compliments that tell you how talented you are. When the dinner is finished, slice up the the ears for dessert! What do you use as a centerpiece for your Thanksgiving table? Is it edible or decorative (or both)? Please tell us about it in the comments below. Adorable! I’ve never seen this idea and think that it’s so cute. Sounds good, but where do you use the peanuts that are listed in the ingredients list? ?